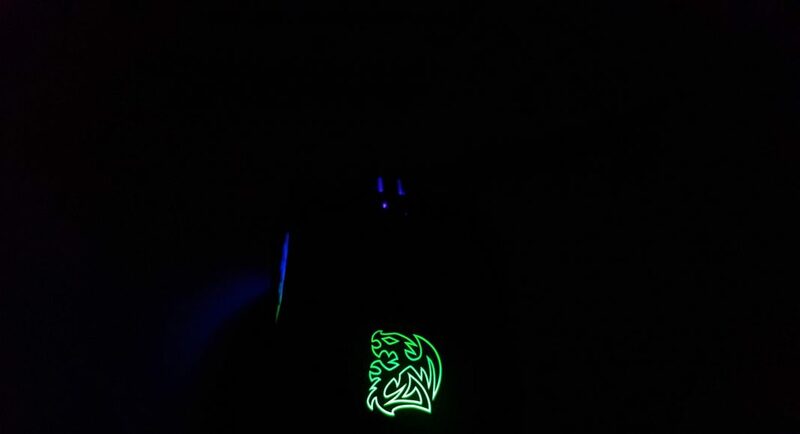 A division of Thermaltake Gaming, Tt eSPORTS is committed to bringing the most personalized and the highest quality gear for the most competitive cyber battles and advances the idea of products designed by gamers for gamers. Tt eSPORTS has continually been a major driving force in inspiring, challenging, and taking to new heights eSports in the professional gaming industry; and currently sponsors a multitude of gaming teams and streamers from around the world by equipping them with the necessary gaming gears – keyboards, headsets, mice and accessories – to compete and succeed at the highest level at major eSport events such as: Dreamhack, Insomnia, epic.LAN and the Intel Extreme Masters. Tt eSPORTS continually strives to promote eSports as a global phenomenon and to put it onto the world stage. 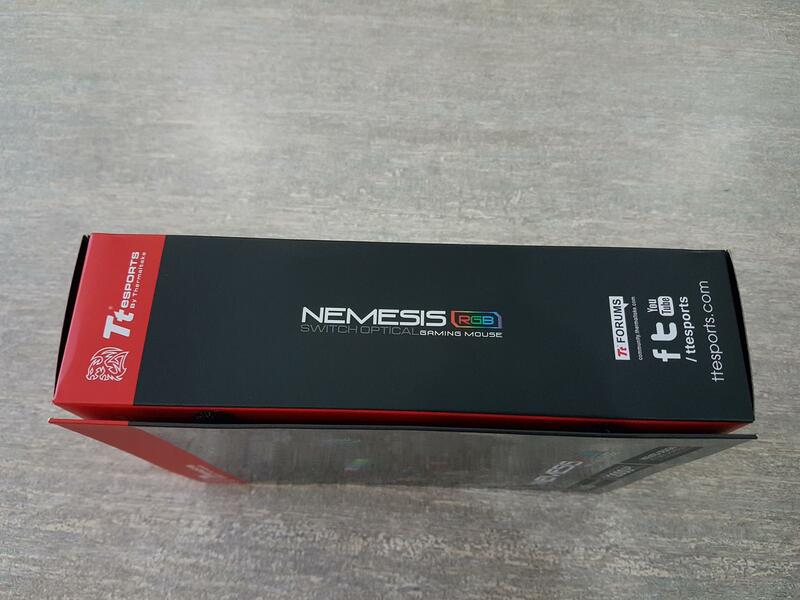 Tt eSPROTS has sent me their new Gaming Mouse aka Nemesis Switch Optical RGB Gaming Mouse. Why switch name in the mouse? 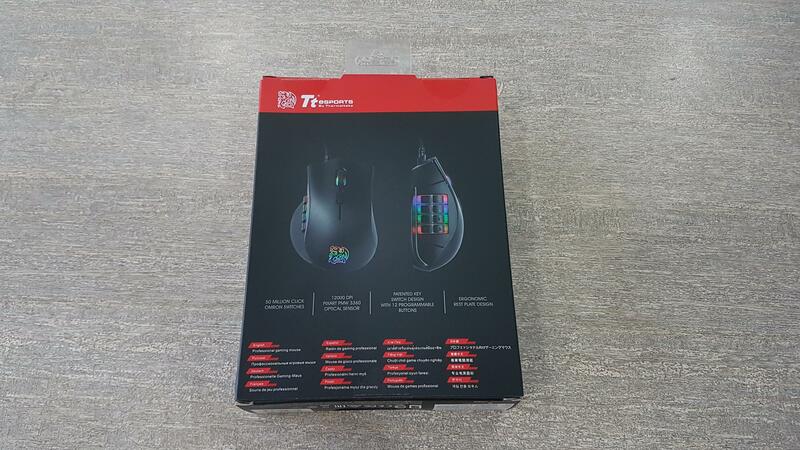 This is because Tt eSPORTS has provided a revolutionary design with this gaming mouse in which user can have up to 12 programmable buttons. What is fun in it? Well, it is a key switching system that has enabled them to achieve what was probably not possible before. Read the content for more detail. 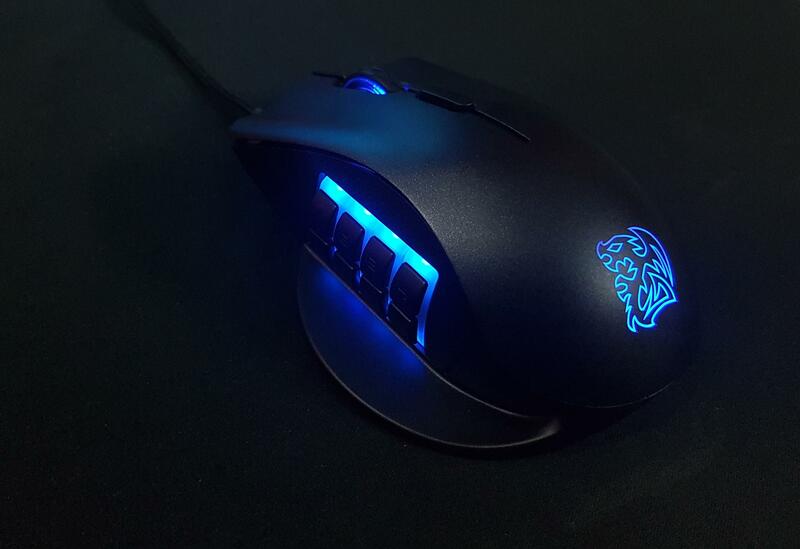 The mouse features Pixart PMW 3360 Optical sensor with up to 12000 DPI using overdrive mode. It has Omron switches which are rated at 50 Million clicks. Last but not the least, it has 16.8M colors RGB backlighting. 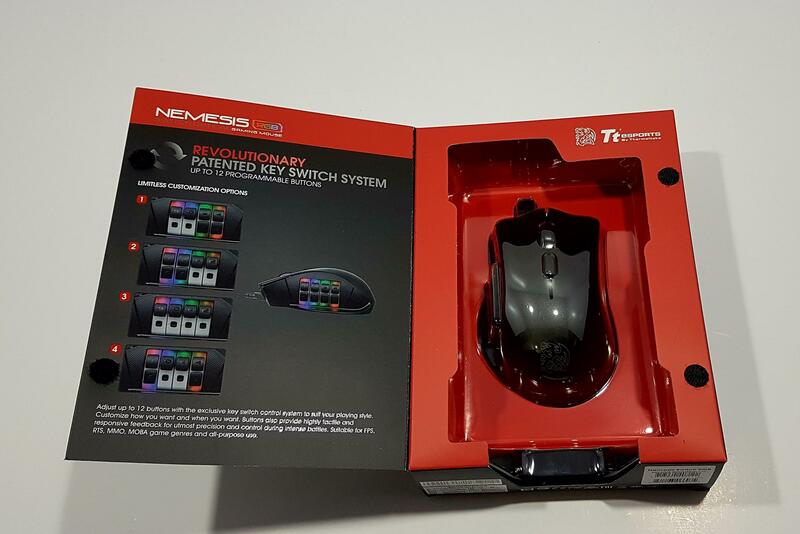 The mouse comes in a Tt eSPORTS typical packing design in a cardboard box. This packing is in black and red colors combination. The front side has a flap cover. On the top, there is a red color background with Tt eSPORTS brand logo and name printed in the white color. 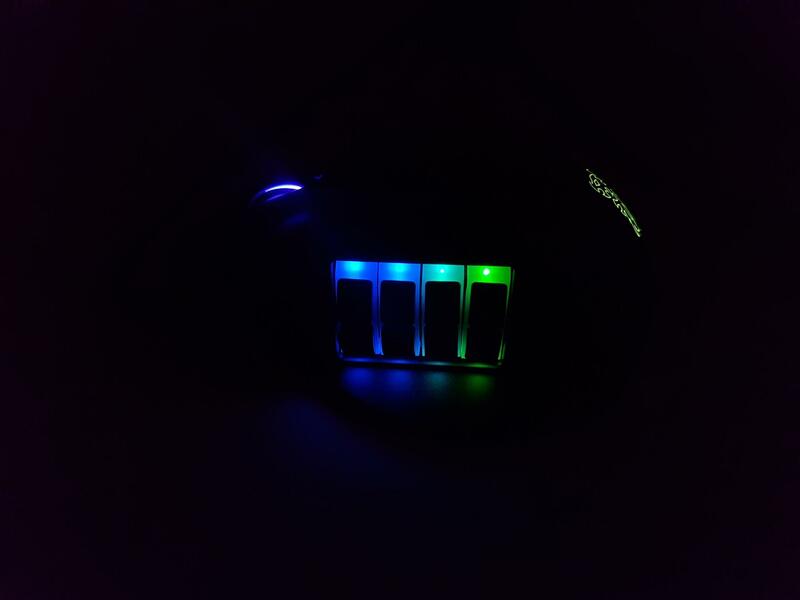 The stunning picture of the mouse in the RGB goodness is printed in the middle. 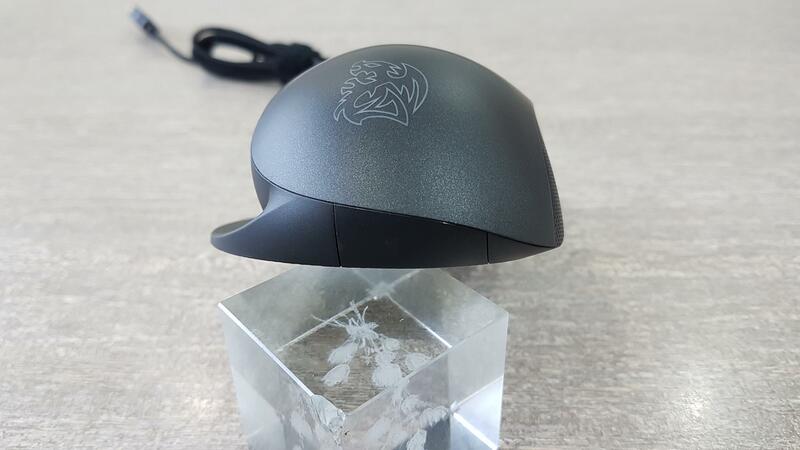 The model of the mouse is printed under that picture. Three salient features have been highlighted at the bottom. 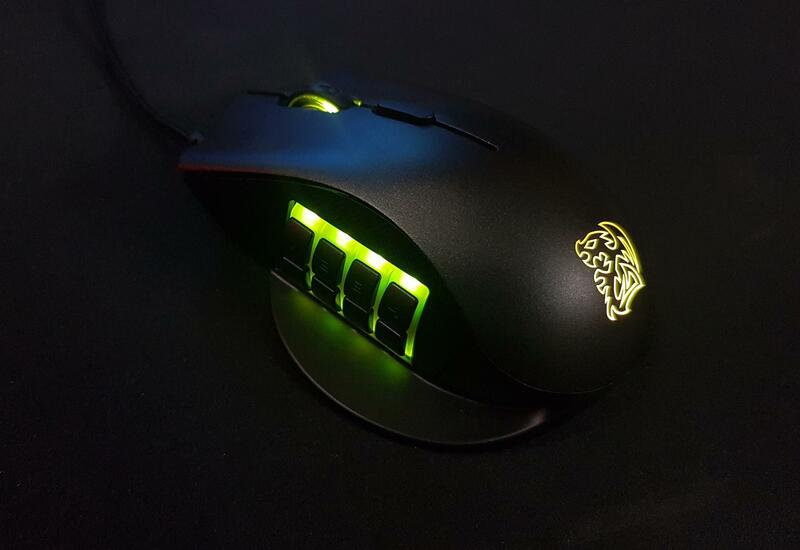 It has 16.8 Million colors RGB backlighting, 12000DPI sensor, and a patented Design key switch system with 12 programmable buttons. The backside has the same color design as is on the front. The top section has the red color background and Tt eSPORTS brand logo and name are printed in the white color. The top view and the side view of the mouse are printed in two pictures. 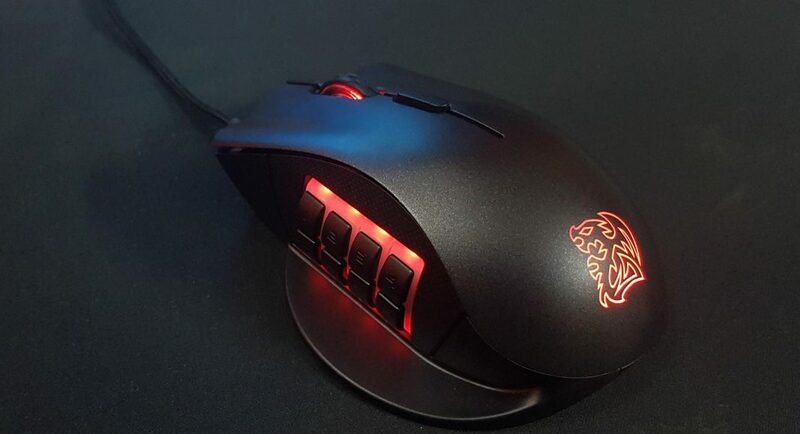 Professional Gaming Mouse is printed in 16 different languages at the bottom. The right side has a top section in the red color background with the Tt eSPORTS brand logo and the name printed in the white color. The mouse model is printed in the middle. Company’s website address is printed at the bottom. The left side has a top section in the red color background with the Tt eSPORTS brand logo and the name printed in the white color. The mouse model is printed in the middle. Company’s website address is printed at the bottom along with the link to their online community. The bottom side has an opening in the middle from where one can take a peek at the rear of the mouse. The EAN and UPC info label is printed on the right side. The serial no info label is pasted on the left side. The product is made in China. Taking the flap cover off would reveal the top side of the mouse nicely tucked inside the plastic container. Tt eSPORTS brand logo and name are printed on the top right side. 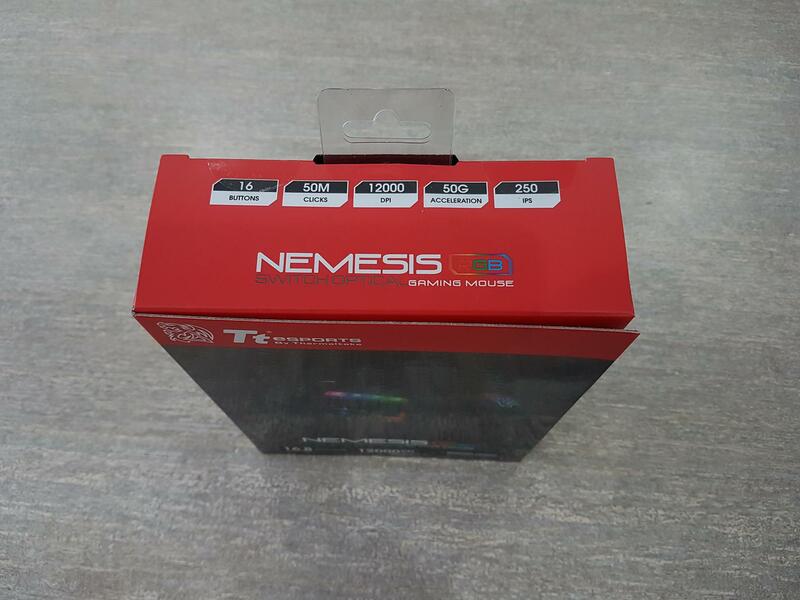 The left side of the cover shows the up to 4 possible combinations of the 12 programmable buttons using the patented key switch system by the Tt eSPORTS. The top side of the packing box has a solid red color background. 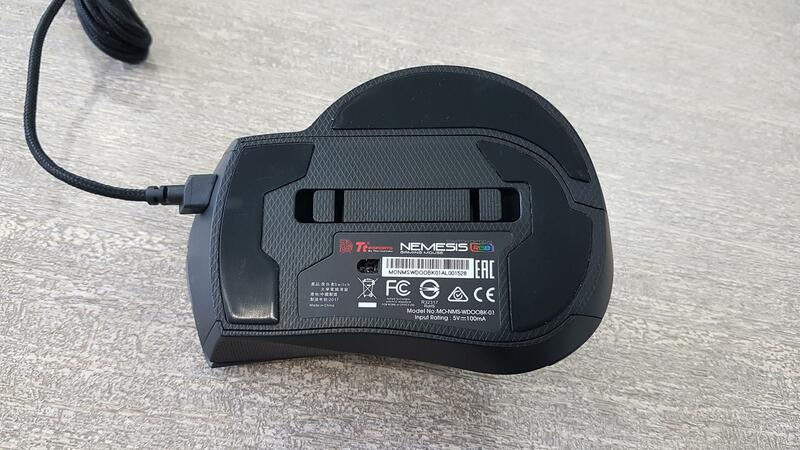 The model of the mouse is printed at the bottom. Key features have been summarized on the top. Tt eSPORTS have upped their game by providing a truly innovative product this year. 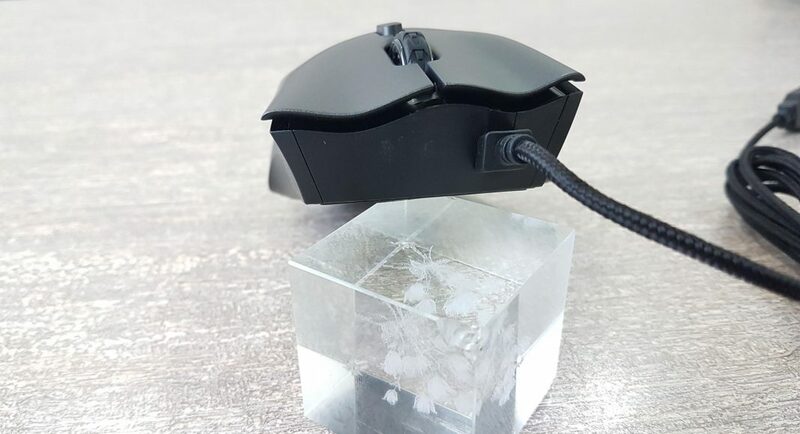 This innovation has been made in none other but gaming mouse where we least expect. Here is what the manufacturer has to say about it. 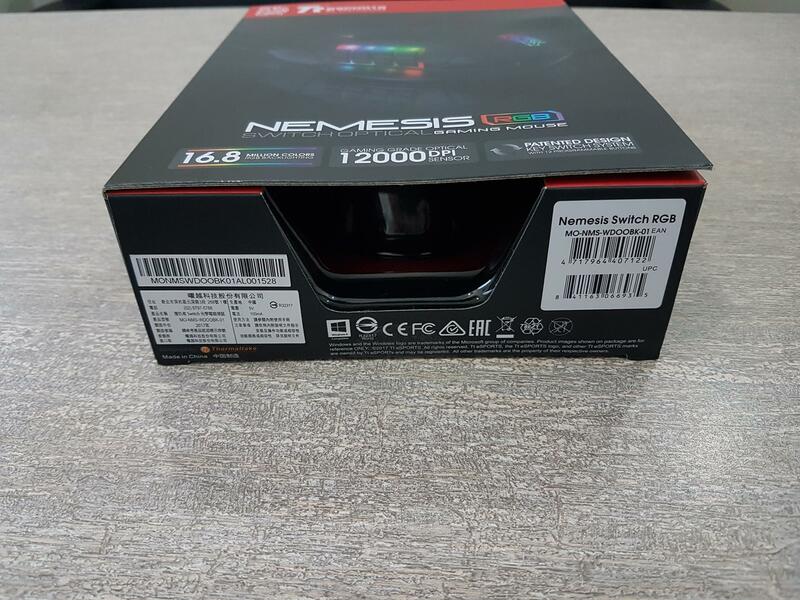 The NEMESIS Switch Optical RGB Gaming Mouse comes with an exclusive patented key switching system for an enhanced FPS/RTS/MOBA/MMO gaming experience. Enthusiasts can customize up to 12 switch keys to suit different playing styles, hand sizes, and for enhanced ergonomic comfort. 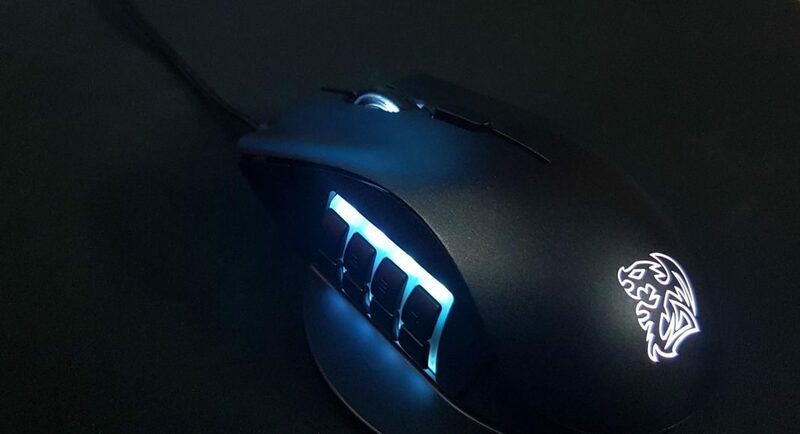 The use of Japanese branded OMRON switches with a 50-million click lifespan provides durable, consistent, and accurate tactile feel with each click for maximum responsiveness; and the use of a PMW3360 gaming grade optical sensor with up to 12000 DPI provides superior accuracy and precision gaming. 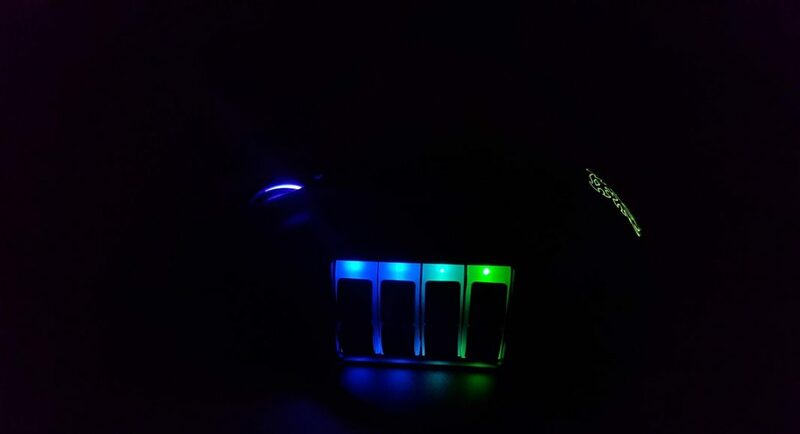 Equipped with 16.8million RGB illumination, gamers can customize their battle colors for added atmosphere. Additional features such as profiles, macro, lighting effects, colors and button controls can also be customized via software. Before digging into the design elements of this mouse, let’s take a look at the two most important aspects of any gaming mouse that make up the gaming mouse. These are the switches and sensor. The Tt eSPORTS features the Japanese branded Omron switches which are rated at the 50 Million clicks. With reinforced key switch design ensures force distribution of each click is balanced and even more durable. 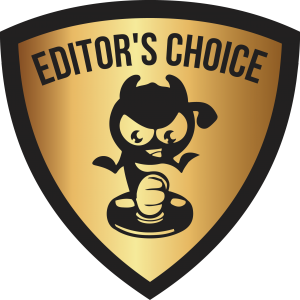 In my experience, I did not miss any click and the mouse is highly responsive on the clicks. The tactile feel is a satisfying. The sound of the right button press is a bit different than the left one. 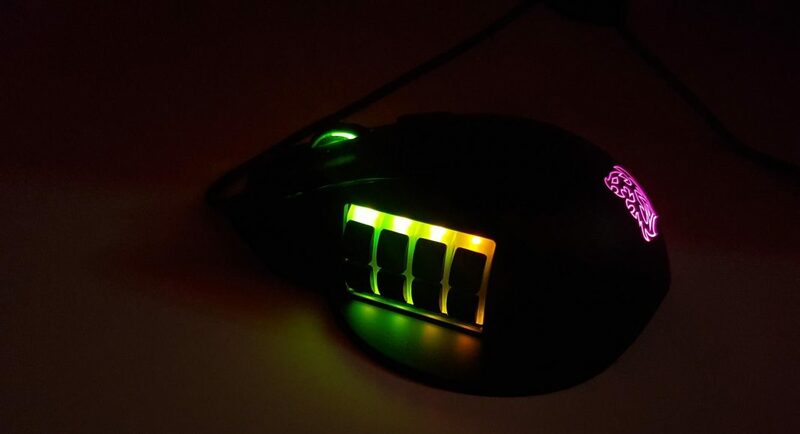 This mouse is utilizing the Pixart PMW-3360 optical engine. The rated maximum DPI is whopping 12000 DPI using the overdrive mode. Default DPI levels are 400, 800, 1600, 3200, and 5000. 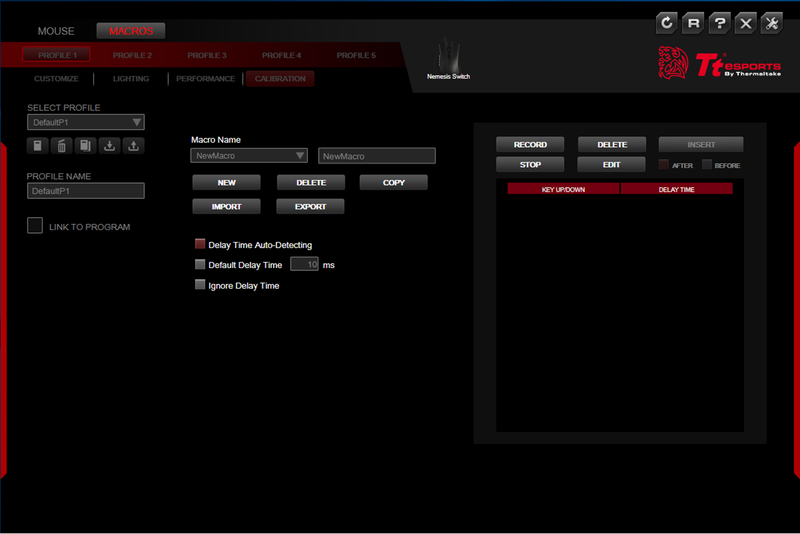 These settings can be changed from the Command Center Pro software provided by the Tt eSPORTS. IPS rating is 250 on this sensor and it is rated at 50G acceleration. The polling rate range is 2000HZ, 1000HZ, 500HZ, 250HZ, OR 125HZ (0.5MS, 1MS, 2MS, 4MS OR 8MS). The mouse has ARM-based 32-bit Microcontroller on its PCB doing all the magic. We can clearly see that Tt eSPORTS mean business with this gaming mouse. 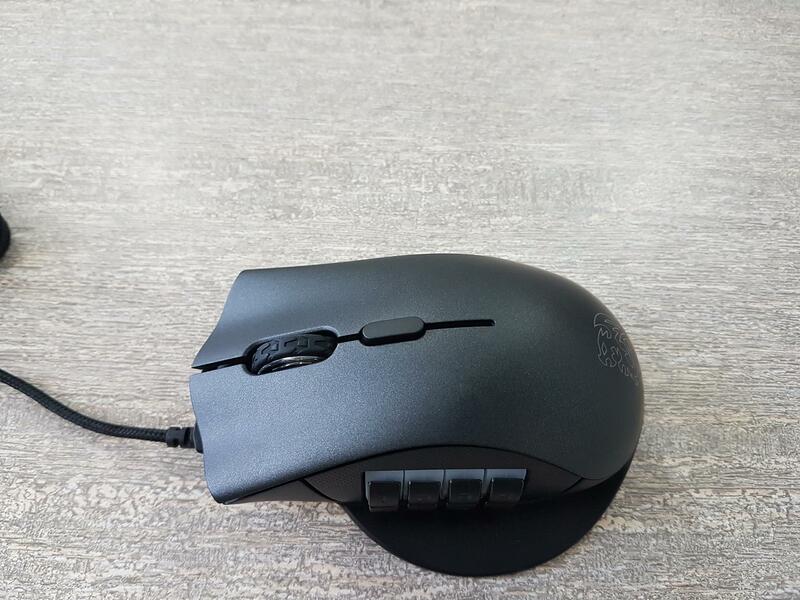 Let’s take a look at the design of the mouse. The top side is plain and in the black color. 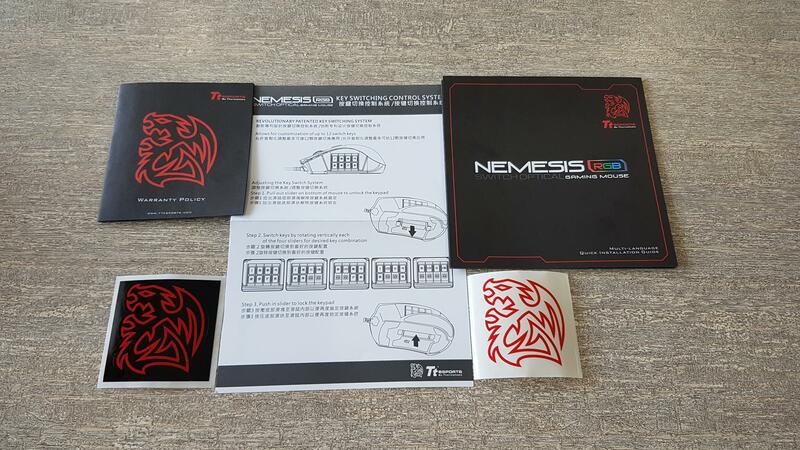 On the rear side, there is dragon logo which has 16.8M colors illumination. On the front side, we have a profile change button. It does not light up. 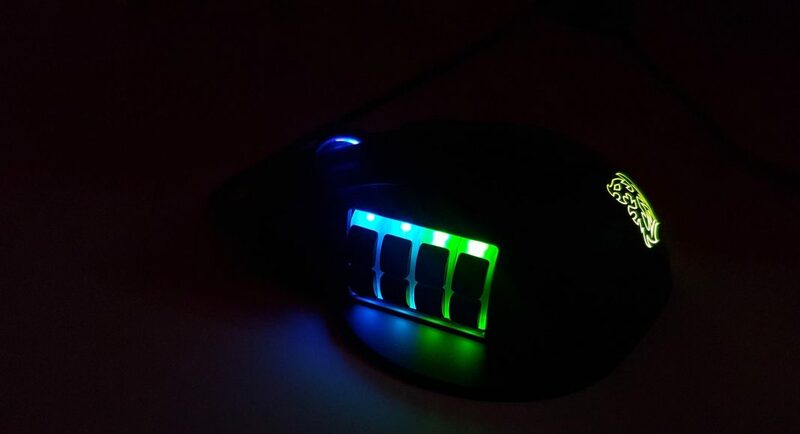 This mouse has 5 pre-configured profiles each with different color schemes. They can be toggled using this button. Then we have an ALPS scroll wheel. It also has 16.8Million colors illumination. 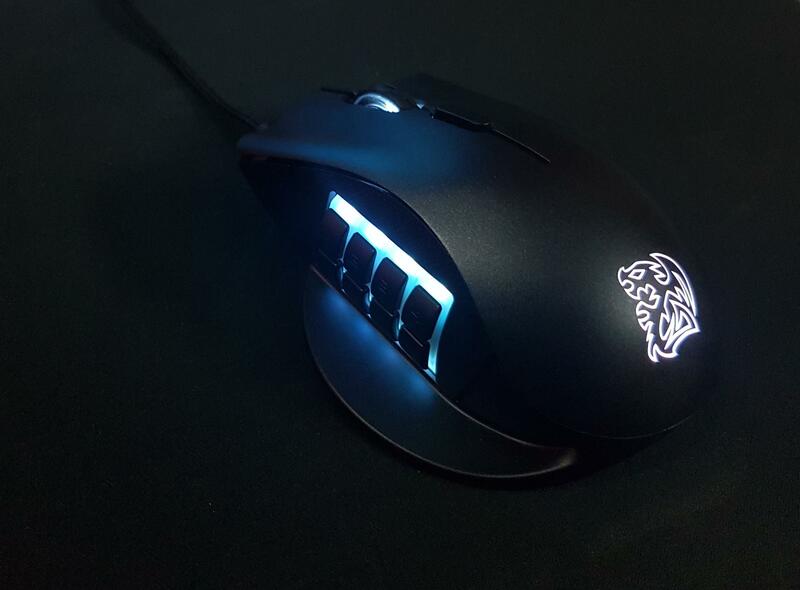 The mouse design is best suited for the palm grip than the claw grip. It is also designed to be better suited for gaming types hence we see a slim in the middle with the widened front end and sloppy rear side. The mouse wheel has a rubber top in a patterned manner. It could be smoother than this implementation as it is like the wheel is rolling in preset steps. Though nothing particular observation but still a room for improvement is there. The rear side shows that the top cover is slopping down towards the right side. 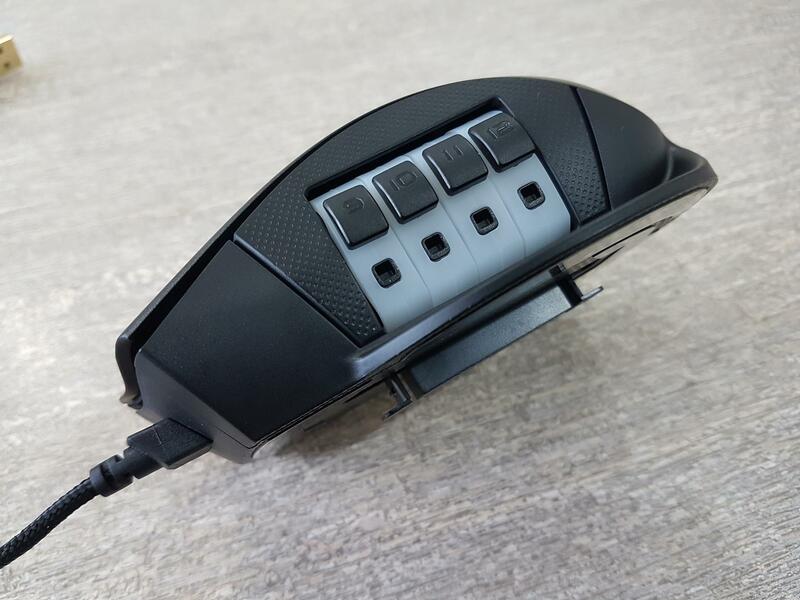 The bottom portion is like compartment design in which the left portion is a part of the ergonomic rest plate on the left side of the mouse, the rightmost portion is a part of the right side’s frame and the middle portion is a part of the bottom frame of the mouse. Overall it is a well-balanced design. 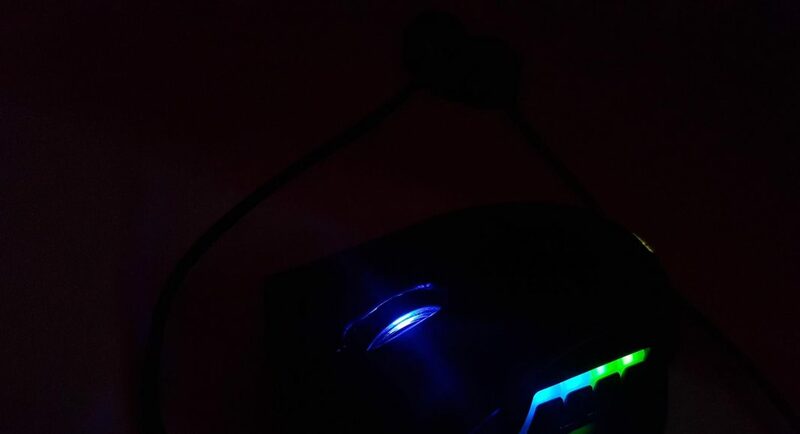 The front side has no RGB illumination and it has a wave design on the frame. Look at the widened gap between the top cover and the base where the Omron switches are present. 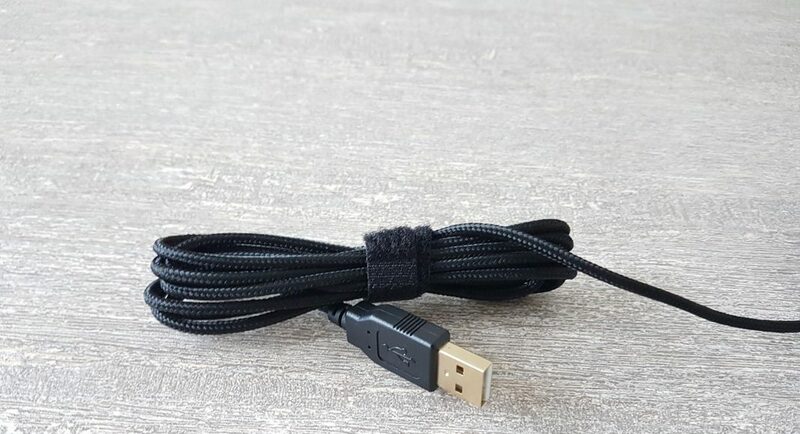 The USB cable is coming out of the left side of the mouse. 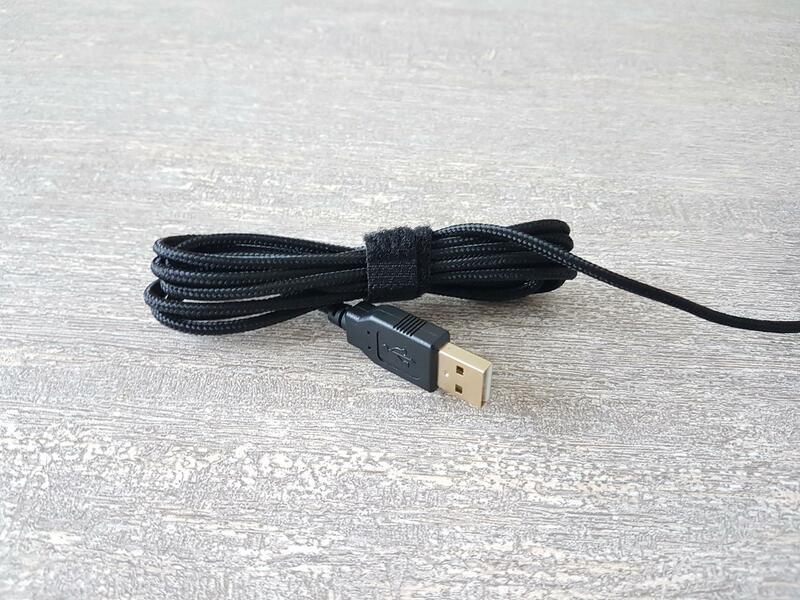 The cable is braided and it is 1.8m in length. 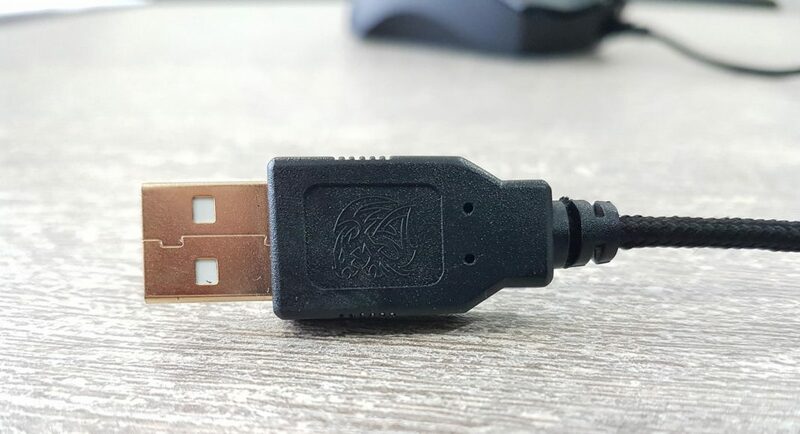 One end of the USB connector has a dragon logo on it. 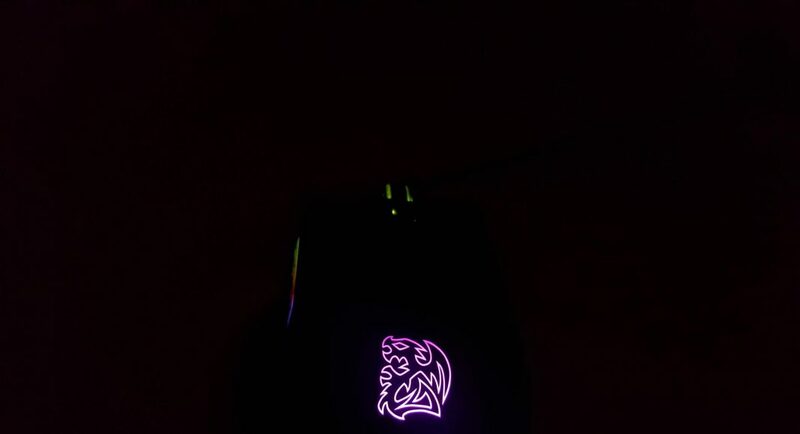 Let’s take a look at the right side of the mouse. The top cover has a bit of a gap with the middle layer. 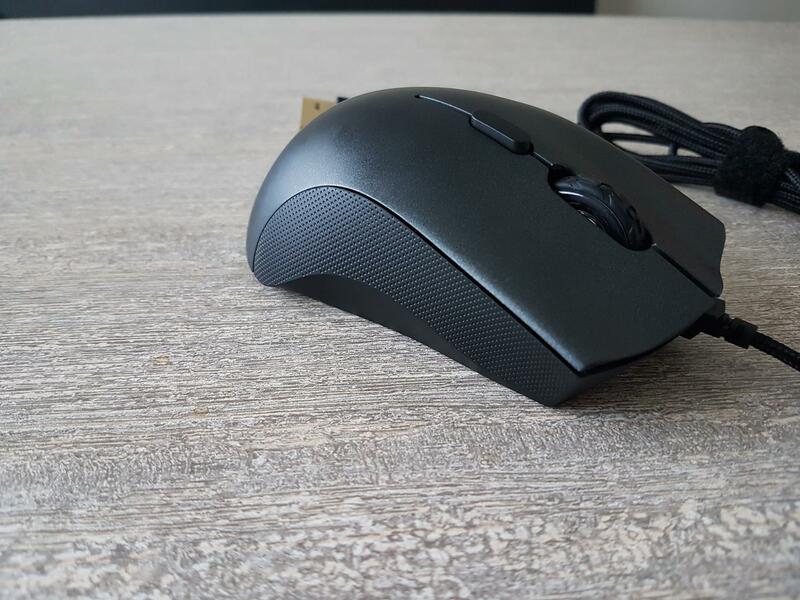 The middle layer has honeycomb style pattern and it does not cover the entire side of the mouse. The bottom layer is inset in the frame and this is where their design team has delivered. This multi-layered design gives the user a perfect grip from this side of the mouse as the baby finger sits perfectly on the bottom layer and the ring finger sits just fine on the mesh design layer. 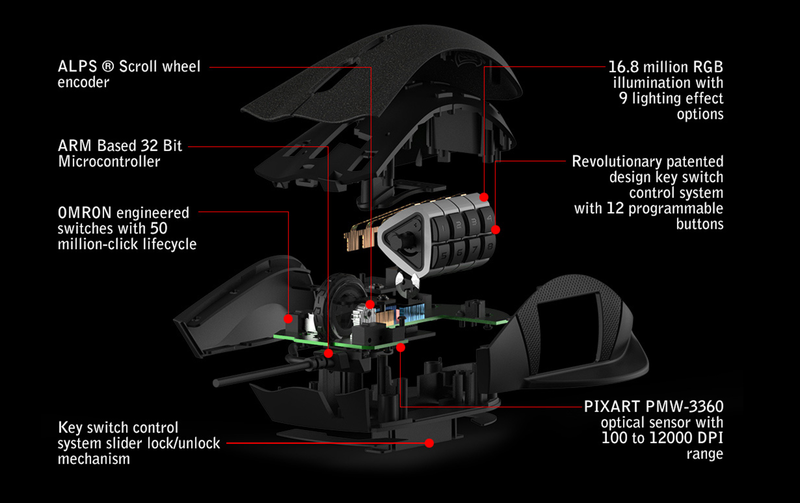 It is time to take a look at the side of the mouse with all the magic and innovation on it. 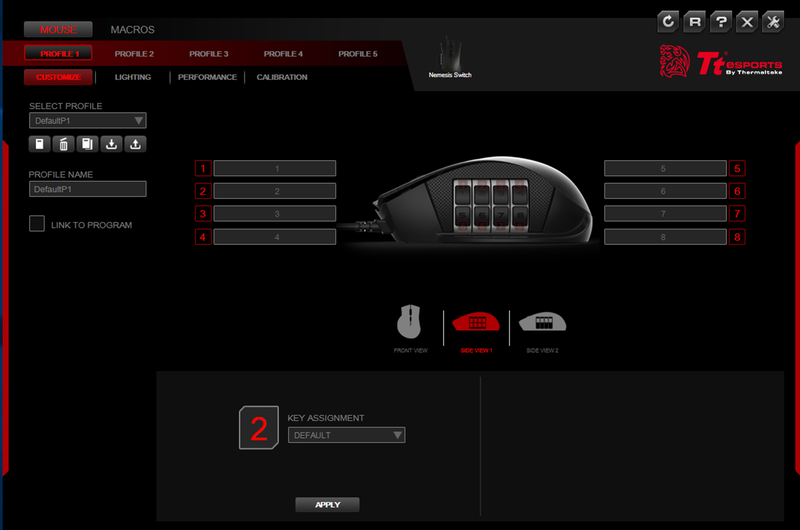 The left side of the mouse almost the same design as is on the right side but there are two key differentiators. The ergonomically designed rest plate is on the bottom of the mouse protruding from the key switch panel. This is where your thumb would be placed while gaming or using. A very well thought out design indeed. The middle section has the same honeycomb-like design pattern and it is covering the keypad. We have 12 buttons implemented in 4 rows and 4 columns. Each column is a slider with buttons installed in an equal distance on it. The first row has buttons numbered from 1 to 4. The second row has the buttons numbered from 5 to 8. To access the last two rows, you would need to pull the slider located on the bottom side of the mouse. Take the slider out by gripping its two ends and press and pull them out at the same time. You will hear a click once it is fully out and locked. Now you can rotate any of the four sliders to your desired buttons configurations. Sliders rotate in upward and downward directions but be careful as they are not free floating type. Once the lower two rows are fully visible, you can’t pull the sliders upward anymore. Same goes for the first two rows in the visible area. The last row is blank with 4 possible button mounts. Once you have determined the possible buttons combination as per your requirements, push the bottom slider back inside the mouse till the latches are full inside the bottom frame. It is that simple. 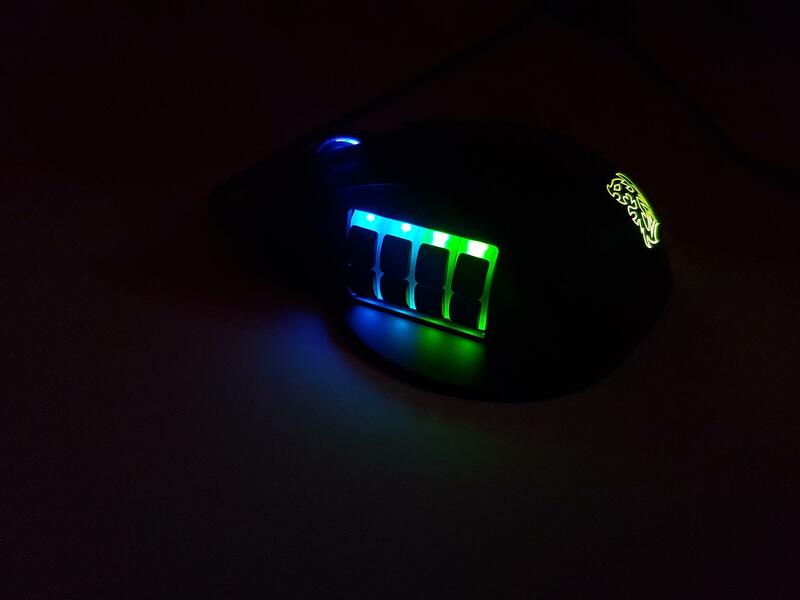 This keypad area is the third one on this mouse with the RGB backlighting illumination with up to 16.8 Million colors. Let’s take a look at the backside of the mouse. It has rubber pads on three sides to avoid scratching on the surface on which the mouse will be used. We have lines crossing patterned design overall. There is a sticker on the bottom side. 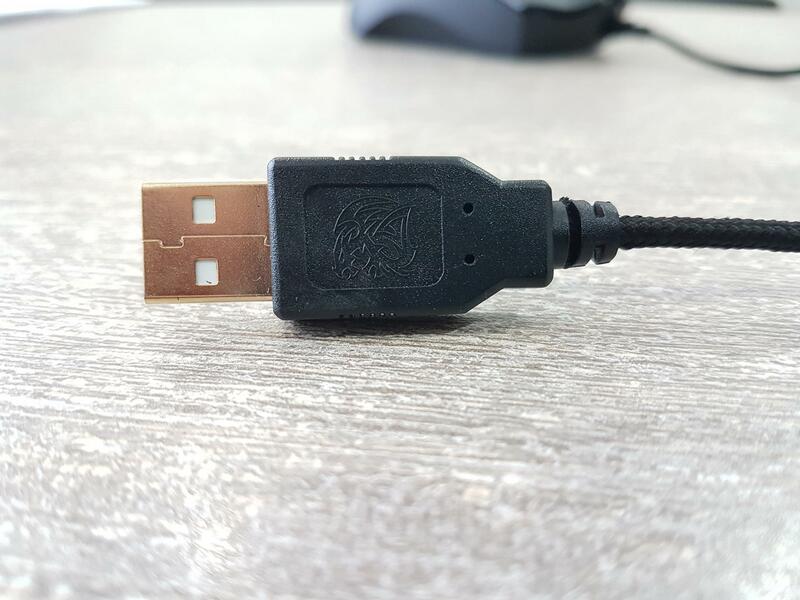 Tt eSPORTS brand logo and name are printed on the left side and the mouse model is printed on the right side. Serial no is printed under the barcode. The mouse takes 5V with 100mA input power for proper functioning. On the left side of the barcode, we have a Pixart PMW-3360 Optical sensor. Above the sticker, we have a slider to change the buttons layout on the keypad. The first zone is the mouse scroll wheel, the second one is the dragon logo on the rear side and the last zone is the keypad where the key switch system is implemented. 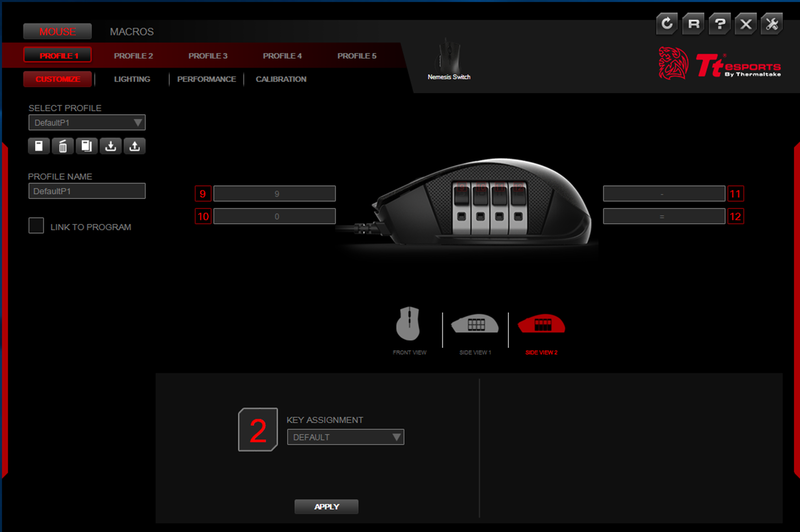 The mouse has 5 pre-configured profiles which can be switched using the top button. The colors and color effects can be changed using the Command Center Pro which will be discussed next. Here are some pictures of different colors and effects. 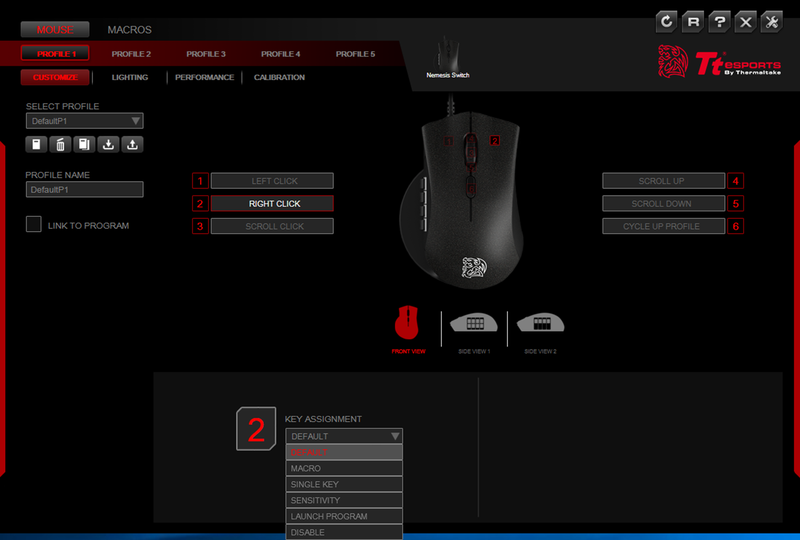 The Tt eSPORTS has provided comprehensive software to control each and every bit of this mouse. This software is called as Command Center Pro and is available from their website. Let’s take a look at the software interface. The software has a well laid out and simple interface to make the life of the user easy and convenient. When you will first time load the software, it may ask you to upgrade the firmware of the mouse. I did upgrade the firmware. On the top, we have two buttons labeled as MOUSE and MACROS. 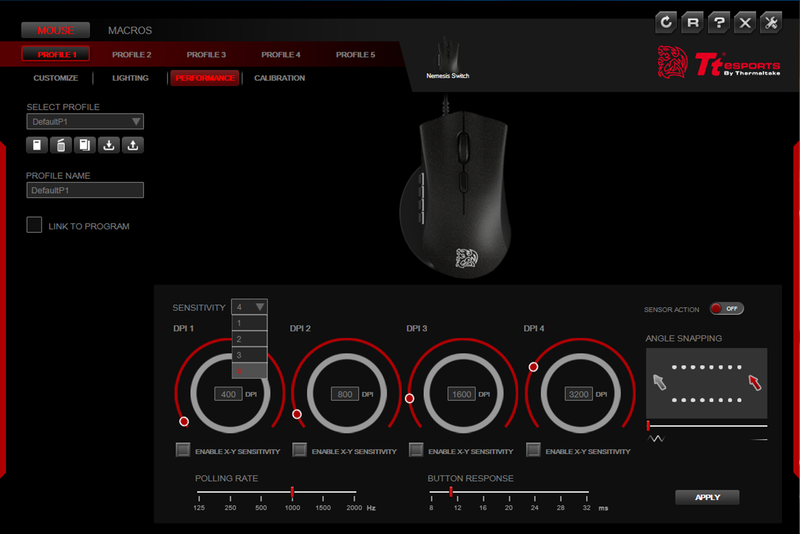 All the functionality of the gaming mouse is under the MOUSE button whereas the macros can be defined in the MACROS section. All 5 pre-configured profiles are listed as Profile 1 to Profile 5. Each profile can be selected to customize its behavior. The first tab selected is the Customized one. It is a default one. 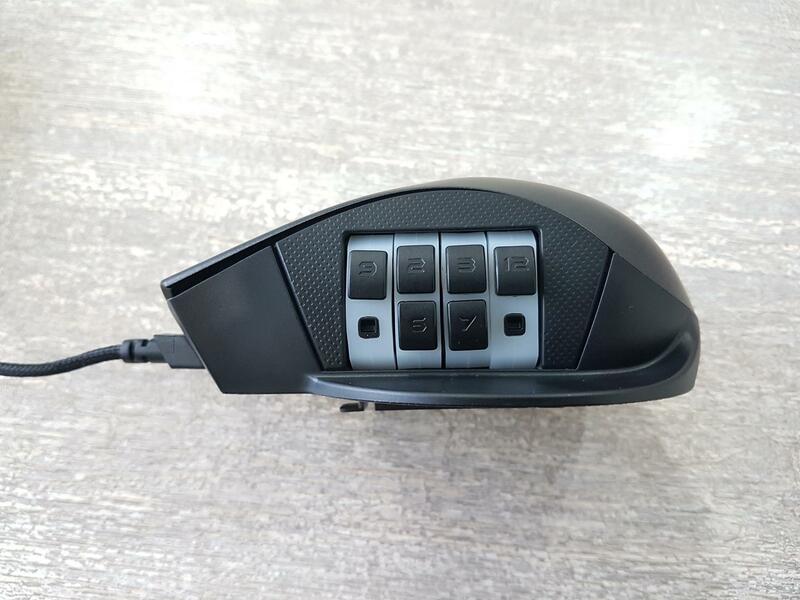 It has the three views of the mouse listed in the middle with the buttons labeled from 1 to 6. Select the button and you can assign the specific key role to this button. Next tab is the Lighting. 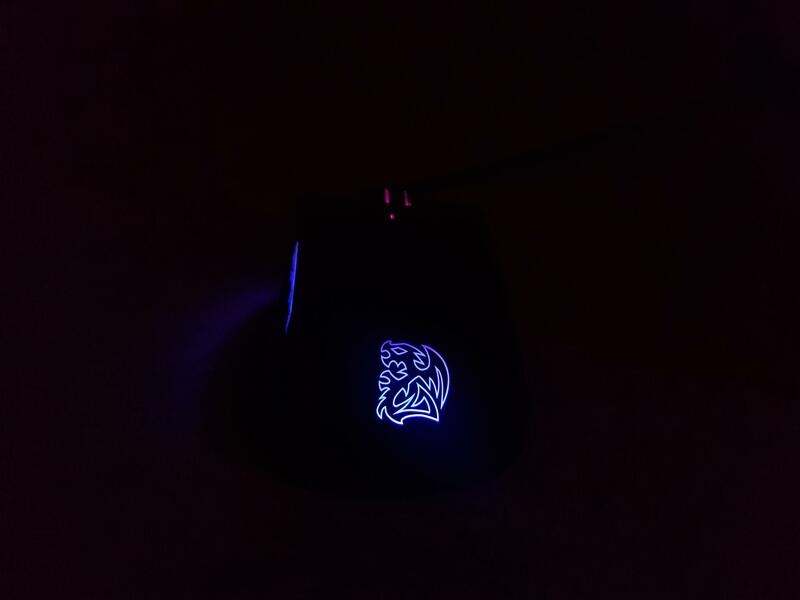 Here you can control the lighting behavior of the mouse and Tt eSPORTS has gone at length to provide you the maximum possible color changing capability. 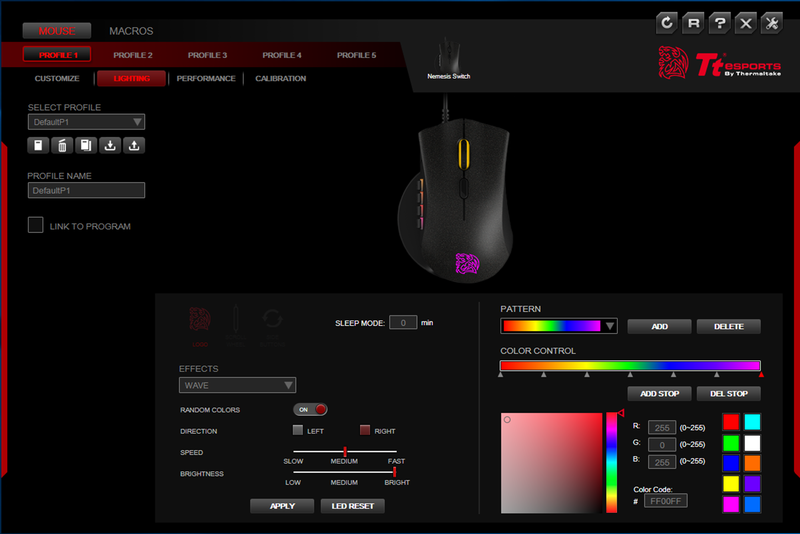 On the top, we have the mouse picture with the three lighting zones light up in the default color profile. The bottom section has the options to change/control the colors and color modes. The three zones are indicated by the dragon logo, scroller, and the button icons. Effects is a drop-down list of all the pre-configured color patterns. You can select any to further customize it like the brightness and speed of the effect. Also, colors can be defined by the color platelet on the right side. We can change the direction of the color effect either from left to right or right to the left. Don’t forget to click on the Apply button to apply the changed made. If you uncheck the Sync All Areas option and click on the Side Buttons option then you will have the option to customize the color of each of the column in each of the rows. I am impressed at the attention to the details that the Tt eSPORTS has provided. Next up is the Performance tab. Here you have the option to change the polling rate in Hz, DPI level, Angle Snapping, button response time in ms and select the sensitivity level from 1 to 4. Each level can then be further customized. Next up is the Calibration tab. 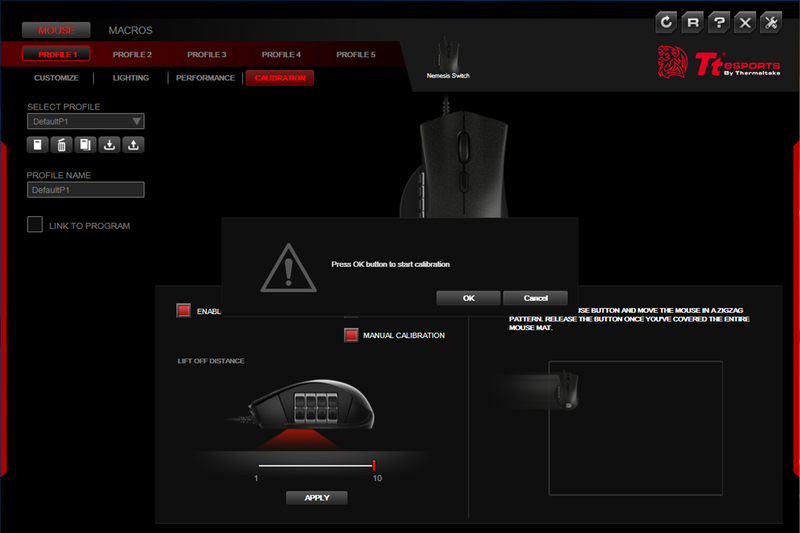 Click on it to access the mouse to surface calibration settings. You will be greeted by the Enable Surface Calibration checkbox. 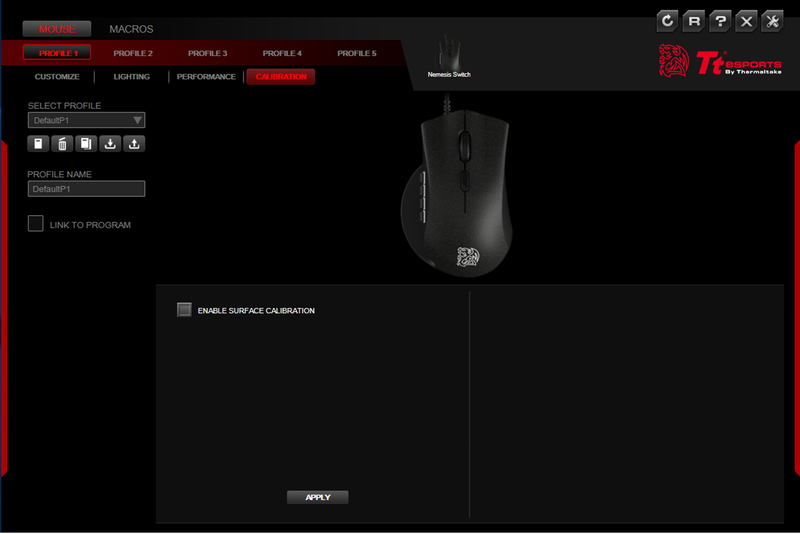 Check it and you will get the option to calibrate the mouse. Tt eSPORTS has provided a list of their own mouse mats to be selected from the drop-down list for calibration. Manual mode is also provided. Click on the MACROS to access the window to define the macros. Macros are independent of the pre-configured profiles. Click on the New button to define the Macro. The name will show in the under the black color background box on the right panel. Click on it and then click on Record button to whatever you would want to do with the macro. Once you are done doing the macro, you can assign the macro to any key under the MOUSE -> Customized tab. The Tt eSPORTS Switch RGB Optical Gaming Mouse is one heck of a design and it is definitely an innovative product. 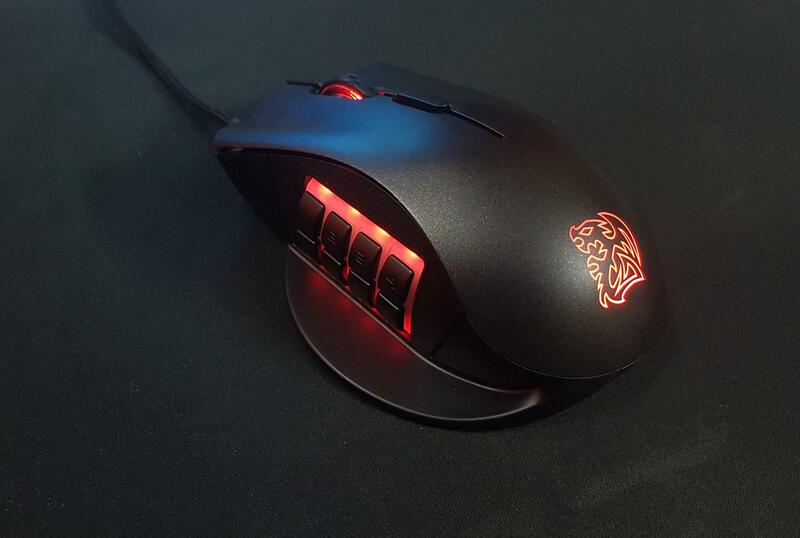 The mouse uses a Pixart PMW-3360 optical sensor with maximum DPI of whopping 12000 using the overdrive mode through the Command Center Pro. It has 5 default levels of the DPI starting from the 400 to 800, 1600, 3200 and 5000. Using the software, one can go as high as 12000 DPI though it is hard to play with the 12000 DPI. IPS rating is 250 on this sensor and it is rated at 50G acceleration. The polling rate range is 2000HZ, 1000HZ, 500HZ, 250HZ, OR 125HZ (0.5MS, 1MS, 2MS, 4MS OR 8MS). The mouse has ARM-based 32-bit Microcontroller on its PCB doing all the magic. 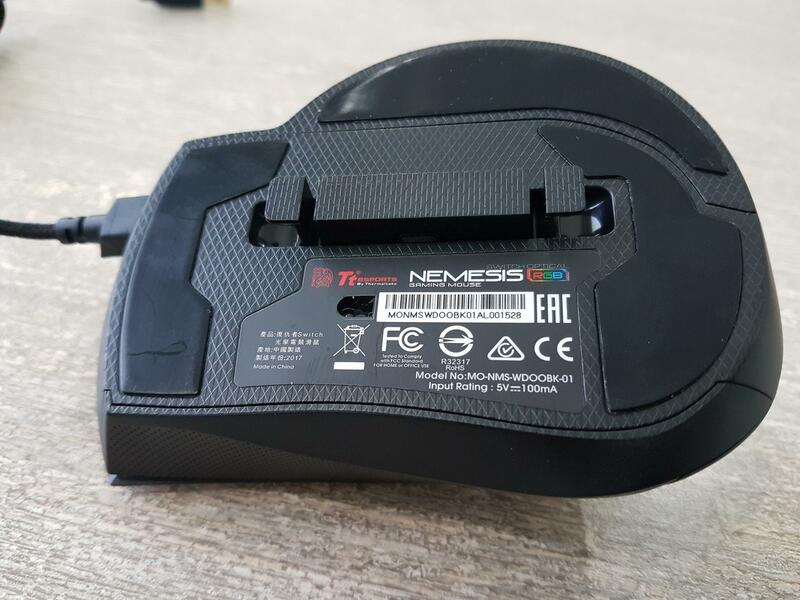 We can clearly see that Tt eSPORTS mean business with this gaming mouse. The Tt eSPORTS features the Japanese branded Omron switches which are rated at the 50 Million clicks. With reinforced key switch design ensures force distribution of each click is balanced and even more durable. 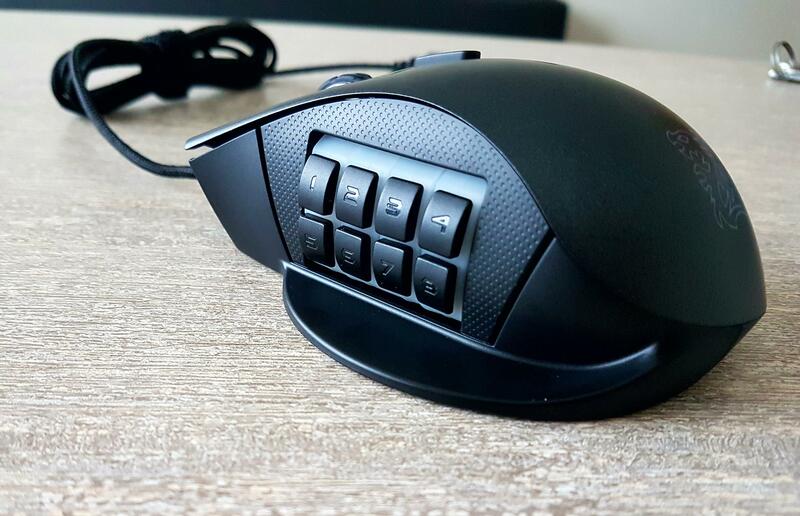 The mouse features the ergonomically placed rest plate which is protruding from the base of the keypad on the left. 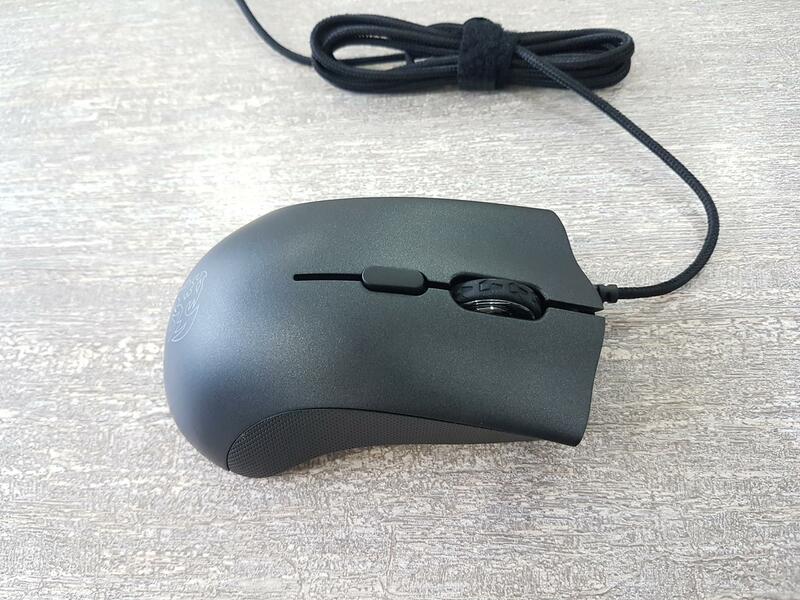 It is designed so as to place your thumb on it while gaming/using the mouse. It is definitely a handy feature. The right side of the mouse has curvature design. We have a honeycomb style layer followed by an inset design. It is a well thought out design to have a comfortable grip on the mouse. 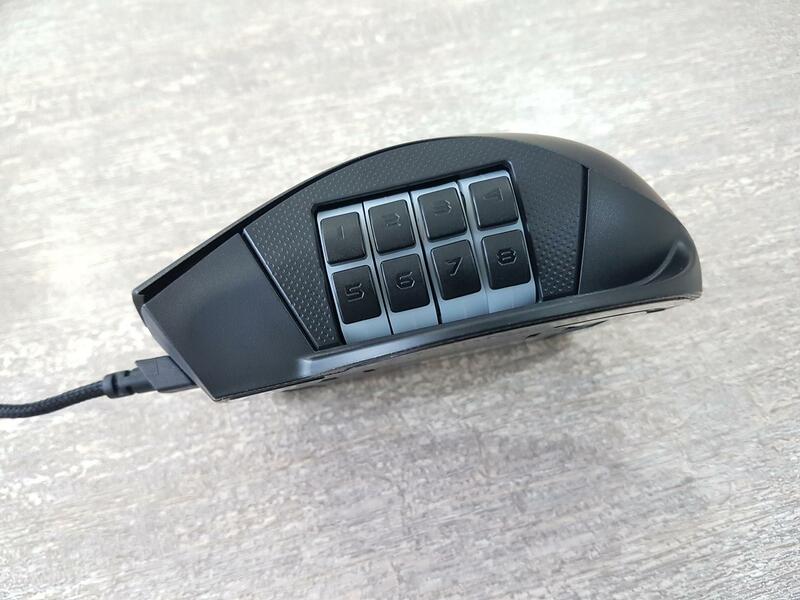 The mouse has a patented key switching system that had enabled the Tt eSPORTS to provide up to 12 programmable buttons on the keypad at the left side of the mouse. We have 12 buttons implemented in 4 rows and 4 columns. Each column is a slider with buttons installed in an equal distance on it. The first row has buttons numbered from 1 to 4. The second row has the buttons number from 5 to 8. To access the last two rows, you would need to pull the slider located on the bottom side of the mouse. Set the buttons configuration as per your desire layout and push the slider inside to lock the keypad. Each button is easy to press and has a nice tactile feedback to it. 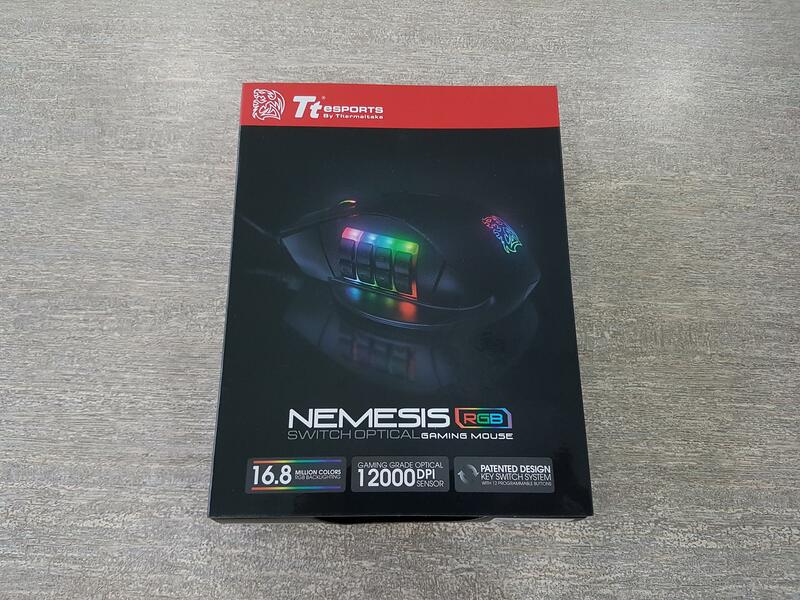 The Tt eSPORTS Nemesis Switch RGB Optical Gaming Mouse comes with 16.8 Million RGB colors backlighting. It has three lighting zones which can be individually controlled or synced together. 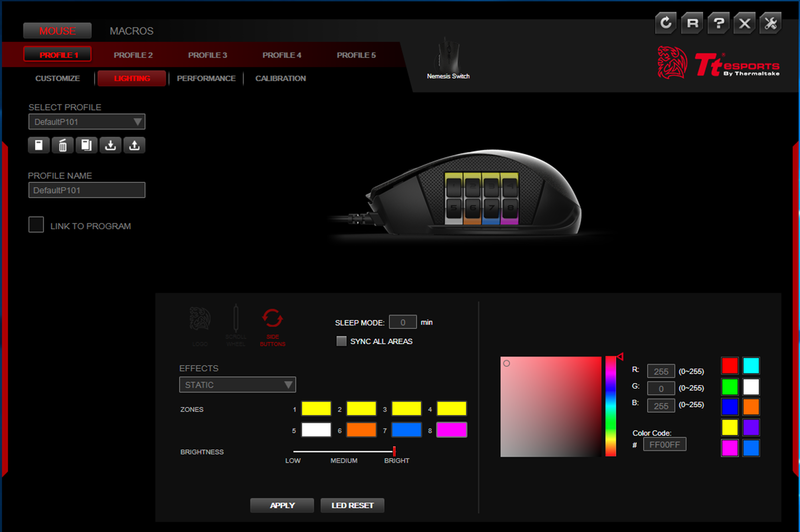 The mouse has 8 pre-configured color effects which are Static, Pulse, Spectrum Running, Snake Marquee, Wave, Reactive, Blink, and System Temperature. 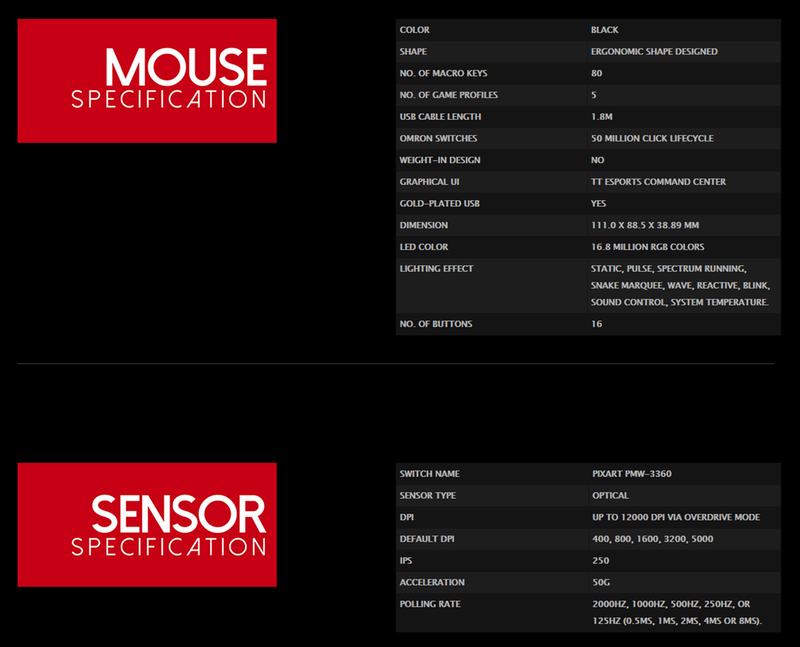 These can be controlled/switched to from the Command Center Pro which is dedicated application software for this mouse. Up to 80 macro keys are a possibility with this mouse. 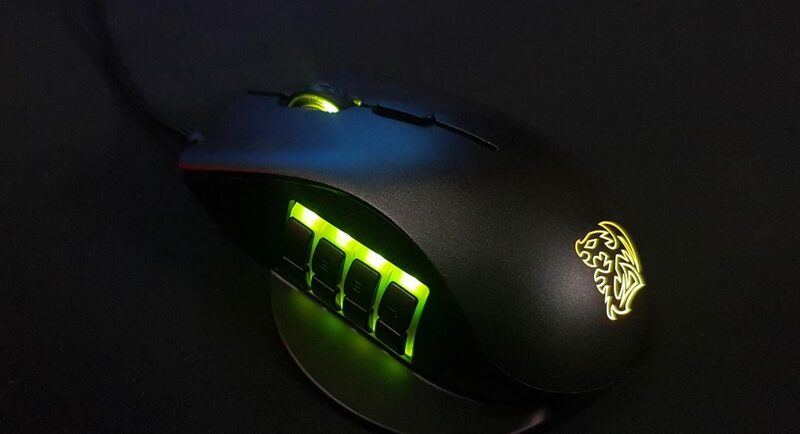 The price of the mouse is USD 49.99 at the time of the review. 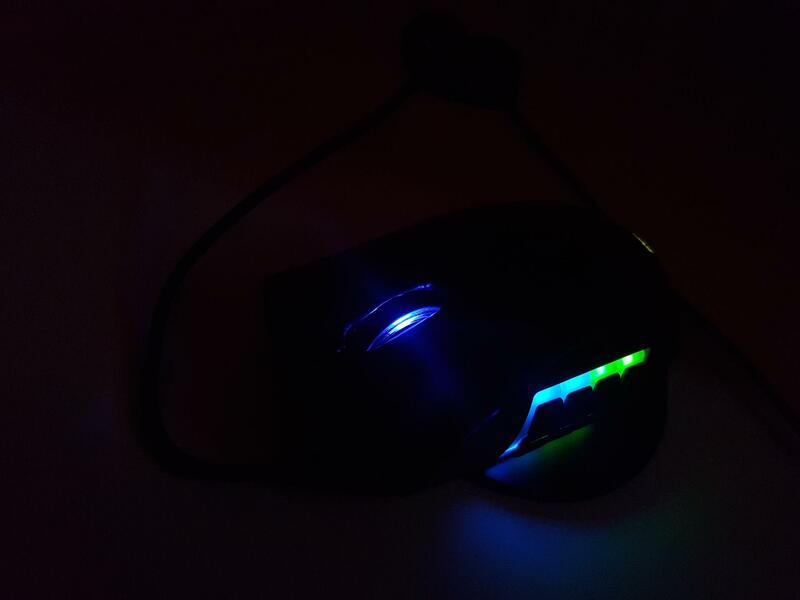 I have spent time with the mouse using it on various surfaces like Corsair MM200 and MM800. Unfortunately, I did not have the Tt eSPORTS mouse mat to test the mouse hence used the Corsair mats. The comfort level of this gaming mouse is too good. Even during the longer gaming sessions, there was no fatigue or irritation of any sort. The sensor is highly accurate and I did not miss any clicks. 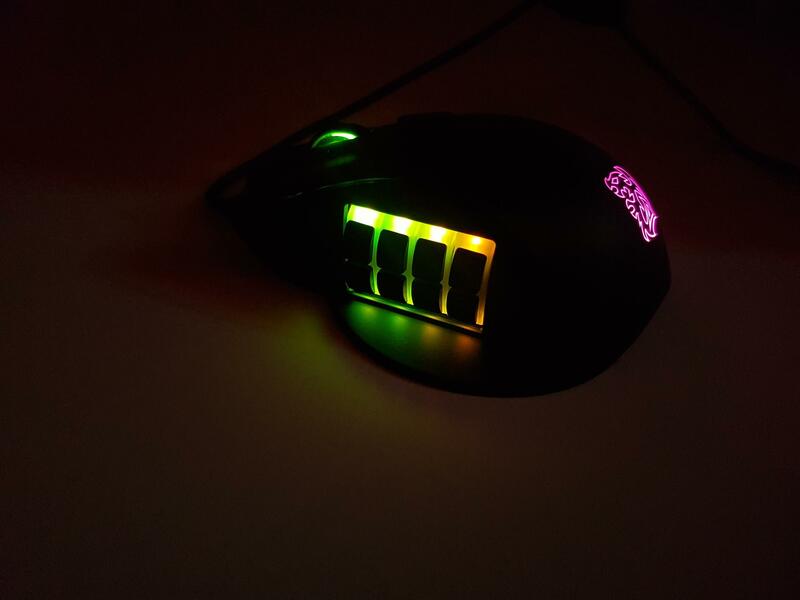 In fact, it was a pleasant and wonderful gaming experience with this mouse. It may take some time to get used to the buttons concept but you do, there is no going back. 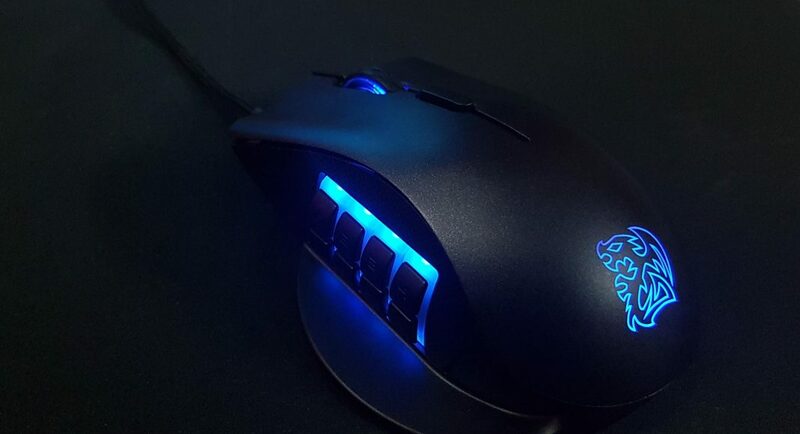 The mouse is designed to be used for any type of gaming not just for the MMO. 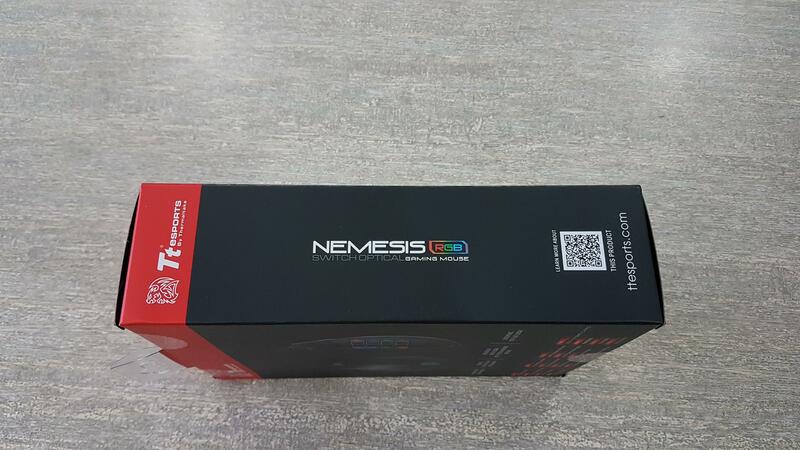 Tt eSPORTS Nemesis Switch Optical RGB Gaming Mouse brings an innovative design coupled with the utmost comfort level, amazing performance and 16.8M RGB backlight illumination on three customizable zones. 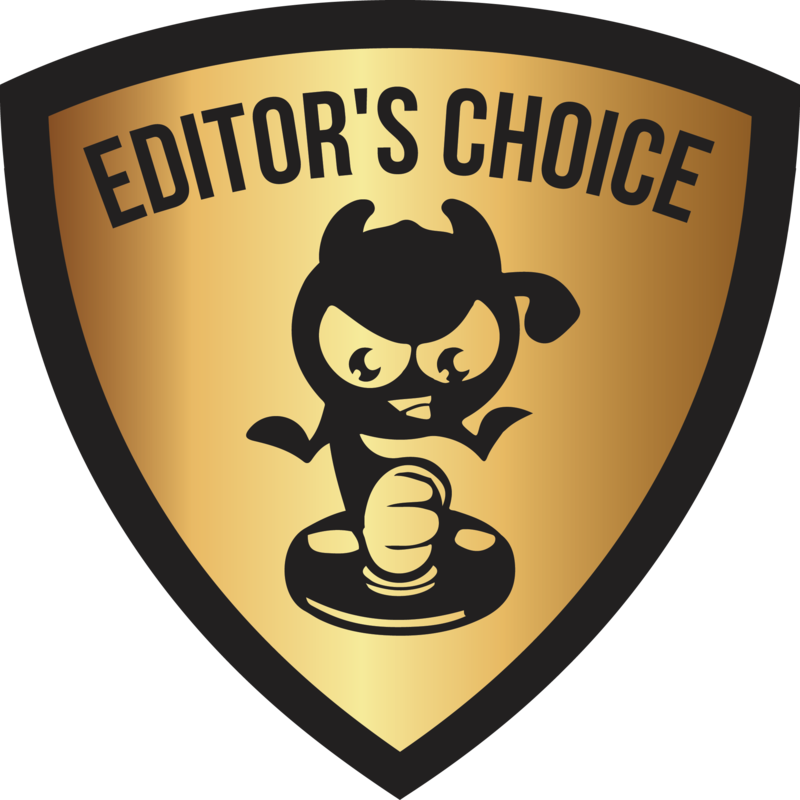 All these features in yet $49.99 price bracket is a killer deal and there is no surprise if it is the second product at tech4gamers with the Editor’s Choice Award.